Hey everybody! How's it going? Those look incredibly delectable to me! That gorgeous photo on the business card (left) is by Anikibee (Anja), I believe! For now, I decided to affix it to this very casual corduroy bag I have. I'm kind of loving pins lately, so I'm really digging this! 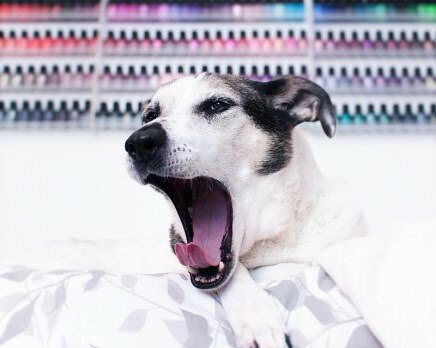 Ready to see some lovely polishes?! Hourglass Nebula is warm-toned chocolate brown jelly base filled with holographic microflakies and iridescent red-to-green color-shifting glitters. This particular tone of brown is not super flattering on me personally, but this is a unique shade that's well-suited for Fall! Formula: It's fairly pigmented and feels pretty creamy too. I had excellent coverage on the first coat, although it can be patchy if you don't manipulate it correctly. It doesn't drag or pull though, and overall is pretty easy to use! Nicely opaque in two coats, and definitely needs top coat to smooth glitter and enhance the sparkly action! The base color can look black in low light, but that really adds to the drama of this shade. I love this one on my skin tone! Formula: It's nice! 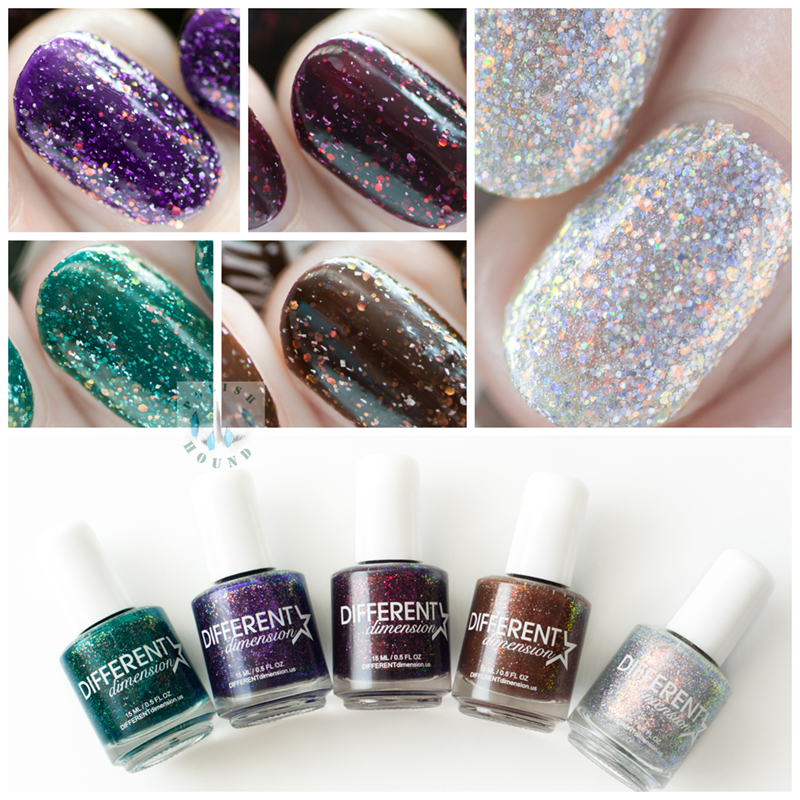 Pigmented and fairly creamy- the glitter is easy to distribute down the length of the nail, although it helps to float the brush and not actually allow it to make contact with the nail through the layer of polish, if that makes sense. Two coats were opaque for me, but it may darken slightly with a third, especially for people using thinner layers. Butterfly Nebula is a violet jelly with holographic microflakies and iridescent red-to-green color-shifting glitters. Ooooh, I think for many people, this will be the stand-out shade of this transitional collection- it is a beautiful and shifty purple! Formula: The jelly base of this one is a bit sheerer than the first two, so the first coat is not exactly streaky, but there can be patches where the coverage is sheerer. The texture is pretty good, but can drag if you get carried away and go back for too many extra brush strokes. That doesn't become a huge issue unless you really overdo it though, and I found it mostly decent to work with. I needed three coats for perfect opacity, but this is so wearable at two, and I would've stopped there if I wasn't photographing it. Helix Nebula is teal jelly filled with holographic microflakies and iridescent red-to-green color-shifting glitters. The base here is much more of a blue-toned teal, while the particles within really make this shade look a lot greener. Very interesting, beautiful color! Formula: Like Butterfly Nebula, the jelly base here is also sheerer than the first two, and it also performed similarly. Application is fairly good, but you can overwork it. Two thicker coats are nearly opaque- three thinner ones are better (although I stuck with two). Overall, not bad. Ghost of Jupiter is a full-coverage glitterbomb with silver holographic glitters as well as the same iridescent red-to-green color-shifting glitters. This has the most lovely golden-orange flash when the light hits it- so beautiful! I wore this baby for a couple days on both hands, and very much admired it! Formula: It's sheerer since the base is clear, but is still definitely buildable. It's easy to apply, and everything distributes very nicely down the nail with no dabbing needed. Three coats are very nearly opaque, and it's so reflective that any possible nail line showing is obscured. Pretty nice to use! Overall, this collection is gorgeous, don't you think? I didn't realize how much I was craving color-shifting flakies until I started swatching these guys. It'd been a while since I'd worn any! Color-wise, my favorite is easily Cat's Eye Nebula, but Ghost of Jupiter is not far behind! As far as formulas go, all were decent to apply, and Hourglass Nebula was especially lovely. I had minor nitpicks with Helix Nebula and Butterfly Nebula, in that I think they're slightly less forgiving than the others. In terms of overall performance though, they weren't bad by any means. All shades here require top coat to smooth the glitter; but, they weren't especially "hungry," and I was satisfied with just one layer of Glisten & Glow- HK Girl.